Mmmm. Grilled cheese sandwiches, Italian style. Just a quick intro today. I’m running late and have to get busy at work. pancetta and basil. That's all. On Saturday I showed you how to make homemade mozzarella. So the challenge was to now use it in a recipe where it would be the star, as opposed to a bit player. Nothing has cheese as the main ingredient like grilled cheese sandwiches. Usually I make them with orange processed cheese “food” slices (that’s what the packaging calls them), butter and white bread. They’re a guilty pleasure, and probably one of the most unhealthy things you can eat. But there is a recipe that is always in the back of my mind that I love. It’s for a mozzarella and anchovy fried sandwich. This wonder of a heart stopper has a slab (about 1/2” thick) of mozzarella cheese in the centre. The bread is then dipped in an egg/milk batter and semi-deep fried in olive oil. Mmmmmm….. Unfortunately the spouse and I differ on the desirability of anchovies as a food source. I love a good black olive and anchovy pizza. He won’t touch it. And egg wash for dipping before frying. That means no anchovy/ mozzarella sandwiches for us either. So I switched out the anchovy for pancetta and added some basil. Raw pancetta can be a bit “fatty” tasting. So I broiled it to partially cook it before use. If you’re OK with pancetta from the package, skip that step. 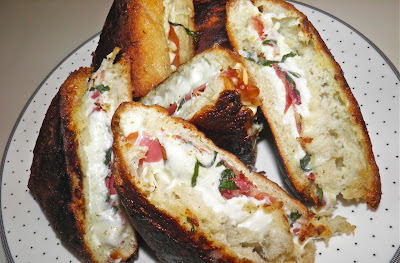 I did it to make these kind of like bacon and cheese sandwiches, but Italian style. These were excellent. The homemade mozzarella cheese was perfect. I used a ciabatta loaf (because it was on sale…) but thick sliced bread would be equally as good. The egg wash would soak up a little more if you used slices. 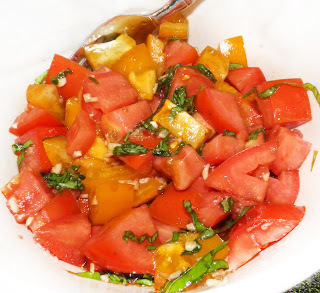 I made a quick tomato salad to serve as a side dish. Just a few simple ingredients tossed together. Delicious. 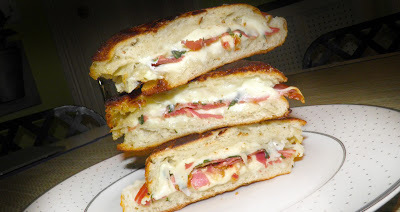 Bread, cheese, pancetta, basil, cheese, bread. Dip & fry. Broil the pancetta until crisped in the oven. Don’t let it burn. You just want to cook it a little. Remove and drain on paper towel. Turn off the broiler, but leave the oven on 350°F. Either grate or slice the mozarella and then place it in a bowl. 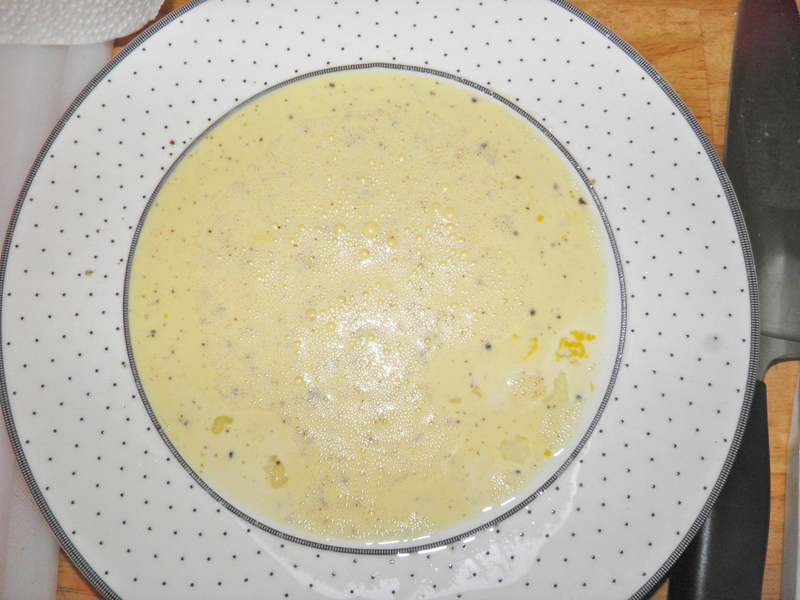 Mix the egg, milk and pepper together on a plate. Chop the basil. Now you’re ready to assemble and fry. Heat the oil in a frying pan. Place some cheese on a piece of bread. Top with 4 slices of the crisped pancetta. 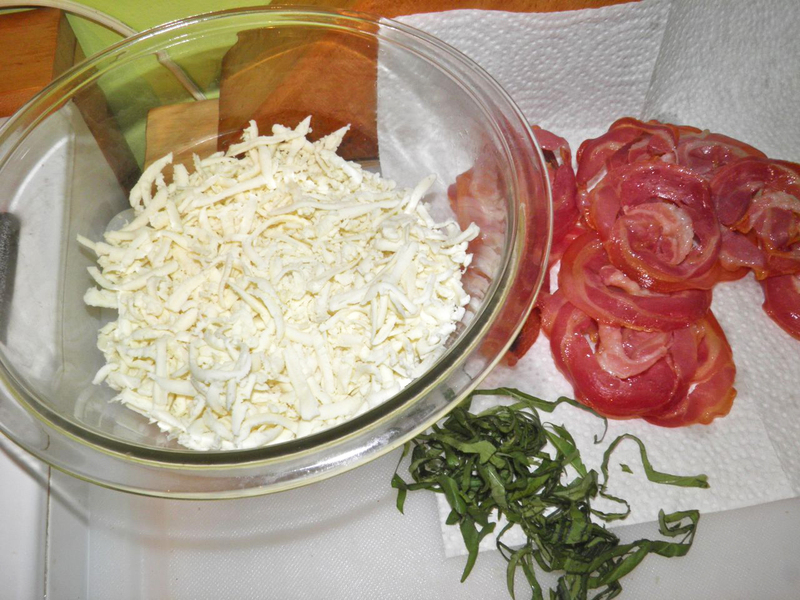 Arrange some basil on top, and them more cheese. Close the sandwich with another piece of bread and press down firmly. 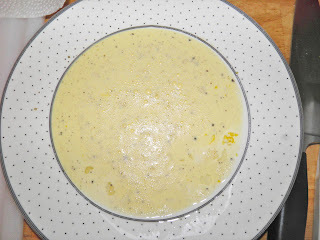 Dip both sdes of the sandwich in the egg mixture and carefully place in the hot oil. you can find tomatoes at their peak. Cook until browned on both sides, and then place in the oven to keep warm while you finish the remaining sandwiches. 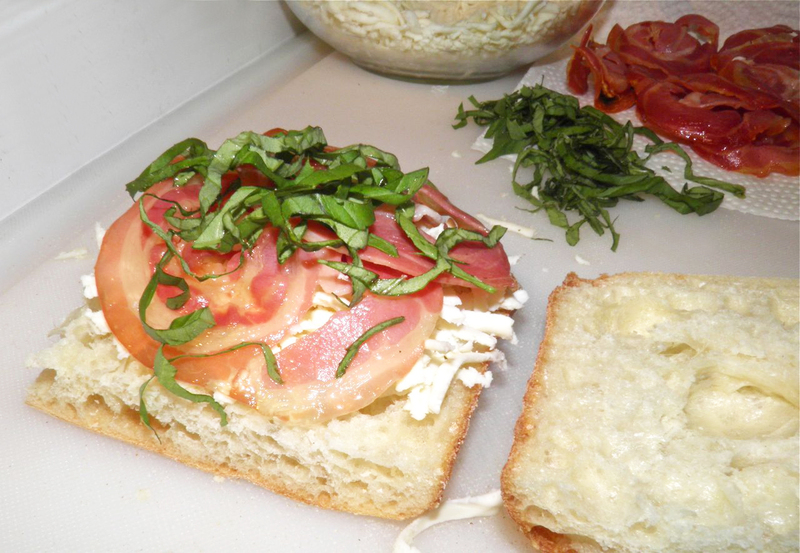 Cut each sandwich into two (making 8) or four (making 16) triangular pieces. Bring to the table on a serving platter and let people choose how many they want. Serve while the cheese is still gooey. Chop the tomatoes into manageable pieces. Place in a bowl with the remaining ingredients and toss well. Bring to the table with the sandwich pieces.